Spend time each week looking for recipes. This may feel like an indulgence, but just let yourself do it. Browse blogs and websites for recipes that look delicious. Hang out on Pinterest. Pile up some cookbooks and reach fo the sticky notes. Get inspired! Ask your family, and roommates what they like to eat. This might sound obvious, but it's easy to get caught up in our weeks and forget to ask our households what they would like to eat. I get extra inspired, too, when I feel like I'm cooking a meal as a gift — trying to please and delight the palate of someone I love. Check the weather. Right now in Texas, the weather is changing all the time! Look at the weather forecast, and try to predict if you're going to be in the mood for soup (or grilled shrimp salad!) on Friday. Keep a meal journal. One of my best inspirations is my own record of things I've cooked in the past. Take a look at what you were cooking a year ago, two years ago. It's a good way to remember things you used to cook, and still love. It happens you cook something your family loves...one time because you forget what it was. Record it! I've made a family binder of favorite recipes I just add new ones to. Start a calendar. Now that you're getting inspired in what to eat, start a calendar of what you'd like to cook over the next few days or few weeks. It can be as organized as a Google Calendar, with notes on each day for that day's menu. Or you can just jot notes to yourself in the corner of your laptop screen. The important thing is to write it down. Go with theme nights (soup night, pasta night, taco night, pasta, beans) Some find it really helpful to have a theme night each week. Monday is pasta, Tuesday is fish, Wednesday is tacos. This doesn't work for everyone, but it may be especially helpful for those of us with kids. See if they want to get involved with planning their favorite tacos one week, or suggesting soups for the next month. Keeping the focus narrow will help you and your household make quick recipe decisions. Choose a shopping day and make a shopping list. Those who have success in meal planning shopped very purposefully. They looked at their recipes and made a shopping list. Some of the meal planning and recipe-saving services let you do this easily, extracting ingredients from the recipes you have saved. Check what's on sale. Some folks really like to organize their meals around sales. Is organic chicken a dollar off this week? Or canned chickpeas? Check out your grocery store circular and adjust your meal plan or shopping list a bit. Plan for leftovers. Most of us have at least some tolerance for leftovers. I regularly cook one or two big healthy casseroles at the beginning of the week and eat off them all week long for lunch. Some people can only eat leftovers for a single night. Either way, try to make your cooking always do double duty. Make a little extra of everything, and if you don't want it right away, freeze it. 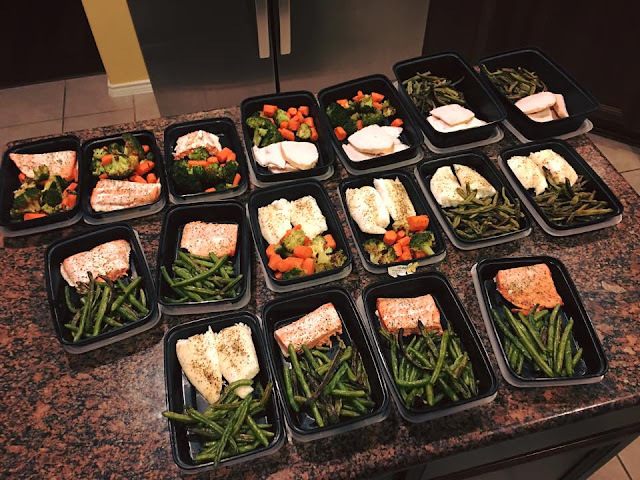 Prep food as soon as you get back from the store. Wash and dry lettuce. Chop onions. Roast vegetables. Brown sausage for pizza. Shred zucchini for quick stir-fries. Stack up glass containers of prepped ingredients in the refrigerator and bask in your own awesome preparedness. If you have to pack a lunch for work I highly recommend preparing those meals in advance so they are ready to go! A chicken breast & a side all neatly packed in a special to-go box. Pop them in the fridge and you are set! You may even be able to do this with dinners, especially if you are following a special meal plan for a certain amount of time. It's also very smart to prepare ready to go snacks in advance. This can save your healthy eating regimen. We all need snacks, have them ready to go! Cook components of your meals. Going beyond prep, cook components of the meals. For instance, start a batch of tomato sauce while you wash greens and prep squash. The sauce can go on pizza one night, and in lasagna the next. Or roast a chicken right then that you can eat that night and use for sandwiches and pasta the rest of the week. Be strategic about freezing. The freezer is your friend. Actually, it's the friend of future you. Make a double batch of that sauce mentioned above and freeze half for later. Make a double batch of soup, stew, chicken cacciatore, cooked beans — throw it in the freezer. Let a month go by, and those leftovers will look fresh and tasty! Don't overstuff the refrigerator. It's easy to get overwhelmed when your fridge is over-full. Also, things get hidden in the back, lost behind the mustard. Don't let things go bad. Keep your fridge airy and light, with a sensible, realistic amount of food in it. Keep a list nearby of everything in the fridge, especially leftovers, as a visual reminder of what remains to be eaten. Keep a well-stocked pantry. Meals are easier and quicker to prepare if you keep your pantry well-stocked. Don't run out of olive oil at inconvenient moments. Have spices ready to dress up chicken and beans quickly. Keep a lemon and fresh herbs in the fridge at all times. All right! What did we miss? What keeps you motivated, inspired, and on track with cooking for yourself during the week? Leave us a comment below! What’s in store for you in 2016? Are you a list maker who jots down resolutions or are you one who chooses to enter the year with a positive attitude while taking each day as they come? What about healthy living and making some efforts to improve your life style? Is that a goal of yours? I don’t know about you, but I like to come up with short term and long term goals. Week by week goals along with quarterly goals that will lead to my ultimate goal. Doing this will keep us from failing. I find ways to hold myself accountable (workout buddies are great for this) and write goals that will be achievable. Healthy living is always on the top of my list. How can we make 2016 more healthy? Can we commit to 3 hours a week of exercise? Can we commit to eating healthier and drinking more water? Can we work on getting the appropriate amount of sleep? Sure we can! First, find a fitness program that makes you feel empowered. One that makes you excited to put your workout pants on. One that helps you see that your personal goals are reachable. A program that you can embrace and one that feels as if it’s a perfect fit for you. Then commit to trying it 3 hours a week for a month. If you don’t enjoy it, try something new, stay at it and stick to your fitness! Your body and mind will thank you. It’ll keep you feeling stronger and more energetic! You’ll see results in endurance and you’ll find a new confidence that hasn’t shined in a while. Now that we have our fitness going on, we have to come to terms with the fact that exercise alone won’t complete the total healthy living goal. So our second item is to make smart food choices. Eating better is key to over all health. The saying “we are what we eat” is somewhat true. If we eat bad we will feel bad. So, cut the sugar and alcohol out slowly. Every day start with a high protein breakfast paired with a complex carb like plain oats, sweet potatoes, whole wheat toast or a fruit like berries or an apple. Include healthy fats like raw nuts and avocado. You can have your coffee…don’t worry I won’t take that away. Just drink it without the sugar and sweet syrups. They are added calories we don’t need, cut them out little by little. I like to add cinnamon to my coffee. Work on eating 5-6 small meals per day. It helps better with planning if we prep our meals/snacks ahead of time and schedule what times we plan to eat. I set alarms in my phone and if I’m hungry before hand I drink a glass of water. Sometimes hunger is triggered by dehydration or boredom. Take your lunches with you to work or while running errands and eat in more than you eat out. You’ll find more success sticking to a healthy eating plan if you have less temptation, so rid your pantry of all the junk food treats. Third, get enough sleep. Sleep is so important for recovery. We use our brains non-stop and we are working hard now. Our body needs sleep to become stronger. We need to grow muscles, restore and repair tissue and allow the release of growth hormone. Without the proper amount of sleep we don’t function to our highest ability and our whole system becomes troubled. Fourth, drink more water. It’s essential to our system. It helps us fight disease, rids our body of toxins, keeps our skin healthier, prevents constipation, reduces joint inflammation and keeps us hydrated! This all may sound overwhelming. Remember being more fit and healthy is a life style. To stick to these goals it’s easiest to start small while aiming big. Whether your ultimate goal is to shed 20 pounds or gain 20 pounds, or to run a marathon or a 5K you need to take small steps to get there. Think of yourself as an athlete training for a big game. You can’t just walk on to the court or field with zero practice and win the game. You have to train and work hard to get there. So go week by week and add something new each week. Your new healthy living plan the first week could just be to add breakfast into your routine and replace 2 drinks (sodas, juices, alcohol, etc.) a day with a glass of water. Go walk outdoors or join a fitness program that you can do 3 hours per week (schedule it in your calendar). Your second week add on cutting out desserts 6 days a week. Save your treat for one day each week. Replace your daily treats with 1/3 cup of fresh fruit and some raw nuts and continue with your fitness program while adding in even more water. Remember good sleep is always important so aim to add an extra 30 min a night each week. Work towards getting 7-8 hours as often as possible. You’ve got this! Happy New Year! LeighAnne Maloy of McKinney is a Boot Camp instructor with Texas Fit Chicks, a one-on-one personal trainer, and a certified sports nutritionist.